Swimmers entered based on results from North/South Half Meets. See MHSAA website for results and qualifiers. Friday warm up lane reservations are only available beginning Monday, Oct. 22 at 8 am through Wednesday, Oct. 24 at 5:00 pm. No lane reservations will be accepted at any other time. Warm up lanes will be available on a first-come, first-served basis. Open for reservations Monday, October 22 at 8:00 am through Wednesday, October 24 at 5:00 pm. TO RESERVE WARM UP LANE SPACE FRIDAY: email shockwavewebmaster@gmail.com and indicate which SESSION (NOT TIME!!!) you wish to attend and how many lanes are required. Teams are strongly encouraged to check in on Friday and pay meet fees and pick up coaches packets between 2:00 pm – 6:00 pm at Tupelo Aquatic Center in the Lobby of the Aquatic Center. Only swimmers and coaches are allowed in the Natatorium on Friday, October 26. Please advise if your team will not be arriving until Saturday morning so warm-up times can be adjusted accordingly. You may do this by emailing shockwavewebmaster@gmail.com on Monday, October 22 between 8:00 am – 5:00 pm. Prelim Warm up assignments will be posted on the MHSAA website no later than Wednesday, October 24. Finals warm ups will begin three hours after the conclusion of morning Prelims. There will be one 45 minute warm up session prior to the start of Finals. MAKE CHECKS PAYABLE TO TUPELO HIGH SCHOOL ATHLETICS. CHECKS MUST BE BROUGHT WITH YOU TO WARM UP ON FRIDAY, OCTOBER 26 OR TO THE MEET ON SATURDAY, OCTOBER 27. DO NOT MAIL CHECKS TO TUPELO HIGH SCHOOL. YOU MUST BRING THEM WITH YOU. RECEIPTS WILL BE PROVIDED IF NECESSARY. ENTRIES: Entries will be based upon the results of the North/South Half Meets. Contact MHSAA for any questions/concerns regarding athlete qualification at misshsaa.com or 601.926.6400. All teams must enter through the glass doors on the NORTH END of the Aquatic Center via the concrete walkway. THIS IS NOT THE DOORS BY THE LOCKER ROOMS, BUT BY THE NORTH END OF THE POOL THAT LEADS TO THE PARKING LOT (this is new from last year). Prior to entry one coach must report to the check in table to pay meet fees and pick up Coaches packets if team has not checked in on Friday afternoon. No athlete or coach will be allowed on the pool deck without a badge. Coaches will receive coaches badges, athlete badges, bus driver passes and Coaches heat sheets in their Coaches packets. TEAM SEATING: Team seating priority will be given to First & Second place overall team standing, Boys & Girls, by Class, from the 2017 State Meet. Open seating for all other teams, first come, first served. No reserving team seats before Saturday morning. Any other reserved seating found in the Natatorium before Saturday morning will be discarded. TIMERS: Teams will be given lane timing assignments based on size. Lane timing assignments for Prelims will be posted on the MHSAA website no later than Wednesday, October 24. COMPETITION: This is a Prelim/Final Meet. 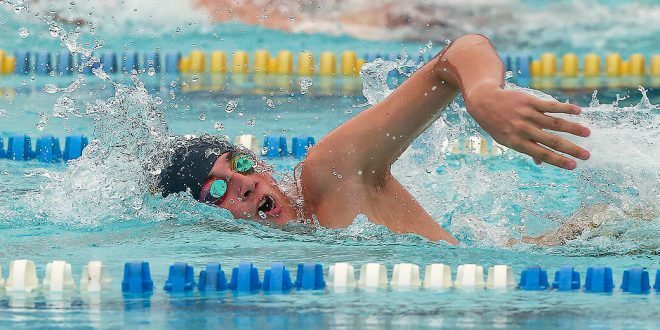 National Federation of High School Association Swimming rules will be observed. These 16 swimmers will be identified by the MHSAA. The top 8 swimmers from each Preliminary event will swim at Finals. LIMIT OF EVENTS: Each swimmer may enter a maximum of four (4) events, no more than two of which may be individual events. Each team may enter up to four (4) swimmers in an individual event and one team in a relay event. FACILITY: Indoor 8 lane (M) 16 lane (Y), 50 meter by 25 yard competition pool. The competition venue for short course has two eight-lane courses, minimum width 8.5’. The competition depth ranges from 5’ to 12.5’. The short course yard pool setup includes up to 16 lanes, six-inch Competitor lane lines, 5 feet minimum depth with one removable bulkhead. Equipment includes Paragon Track Start Competitor blocks. Continuous warm down area will be provided. Timing for both pools will be run on Colorado Time System 6, Colorado Aquagrip Pads, Colorado System Full Matrix LED Scoreboard and HY-TEK Meet Manager. GENERAL ADMISSION: $10.00 per person Doors will open for general admission at 7:00 am. Spectators must enter through the Front Doors of the Aquatic Center and will be given a wrist band that must be worn at all times. Patrons who return to Finals must present their wrist band at the door to gain re entry; otherwise they must pay a re entry fee of $10.00. In accordance with the MHSAA, swimmers who did not qualify for the State Meet must purchase a ticket to enter. They will be expected to sit in the spectator stands and will not be allowed on the pool deck. This does not apply to qualifying relay alternates. CONCESSIONS: Concessions will be for sale. Teams may bring in team coolers with water only. HOSPITALITY: Hospitality will be provided by the Tupelo Convention & Visitors Bureau for all coaches, officials and bus drivers with badges. OTHER: Qualifiers for the State Meet will be posted on the MHSAA website. Questions regarding an athlete’s qualification, times, alternate status, etc. must be directed to the MHSAA. To expedite check in, teams are strongly encouraged to check in on FRIDAY, OCTOBER 26 between 2:00 pm – 6:00 pm. If your team does not plan on warming up on Friday, you still may come by the pool to check in and pick up Coaches packets and pay meet fees. For schools who have 12 qualified swimmers or less entered in meet, you are allowed 1 coach. For schools who have more than 12 qualified swimmers entered in meet, you are allowed 1 additional coach per 12 swimmer. Absolutely no saving seats or roping off areas in the spectator seating. First come, first served. All spectators must enter through the Front Doors of the Aquatic Center. Entry fees are required by MHSAA. $10.00 per person. Spectators will be given a wrist band upon entry which must be worn at all times during the meet. Patrons returning to Finals must present their wrist band for re entry; otherwise they must pay $10.00 to re enter. Spectators will not be allowed to enter the Aquatic Center until 7:00 am on Saturday, October 27. Only coaches, athletes, bus drivers, meet officials, security, meet volunteers, medical volunteers and Aquatic Center staff will be allowed to enter the facility prior to 7:00 am, designated by the appropriate badge/credentials or official uniform. No coolers, food or drinks may be brought inside the Aquatic Center by spectators. Teams may bring in coolers with water only. No parents or spectators are allowed on the pool deck at any time unless they are timing or officiating. This will be strictly enforced. Any parent repeatedly found trying to violate this rule will be removed from the facility and will not be allowed to return. Please only park in designated parking spaces. Parking on the grass or curbs is prohibited. Cars will be towed if found in violation at the owners expense. Buses will have designated parking in the north end of the parking lot. No leaning or loitering on the stadium railing overlooking the pool. This will be strictly enforced.